Commonly known as the Chilean Bellflower or Copihue, Lapageria rosea is an ornamental climbing plant noted for its gorgeous evergreen foliage and tropical effect, waxy blooms. Native to the Valdivian temperate rain forests flora of Chile, it can grow to a height of over 10 m high given favourable conditions. 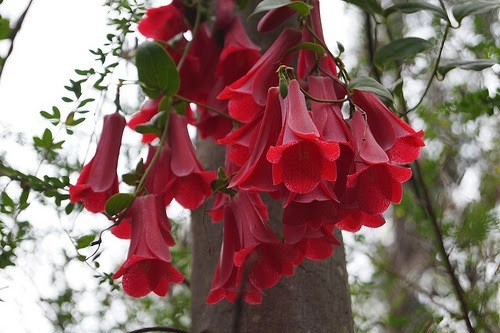 Lapageria rosea seeds should be sown as soon as they are purchased and it is not unknown for shop bought seed to have begun germinating in its packet. These of course should be sown immediately. 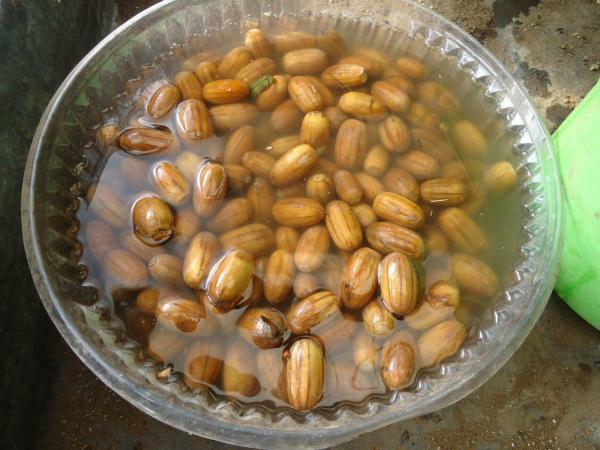 Any seeds not showing signs of germination can be soaked in lukewarm water for 25 hours prior to planting. Before sowing, as there can sometimes be a layer of pulp which can inhibit germination. In its native habitat, Lapageria rosea will be found growing in the humus-rich, lime-free soil. So when propagating from seed use a good quality ericaceous compost rather than a specific seed compost. Using 7.5 pots, sow at a rate of one seed per pot. Cover seeds with its own depth of compost or vermiculite. Place inside a heated propagator at a temperature of between 15-18 degrees Celsius or seal inside a clear polythene bag. Place in a warm bright position but avoid direct sunlight during the warmest part of the day. Germination will occur from 1-3 months. Keep the compost moist but not waterlogged and do not allow the compost to dry out as this can cause germination to fail. If you live in a hard water area, avoid using tap water. Instead, water with soft water, or boiled rainwater. Germination is somewhat sporadic and so each pot-grown seedling should be removed from the propagator or bag as it emerges and grown on under frost-free conditions. It can often take a couple of months for the root system to establish inside the pot so water sparingly during this period. Lapageria rosea seedlings require very little plant food, and are known to be sensitive to fertilisers high in phosphates. Pot on as required into 20-25 cm pots or plant directly into the ground in dappled shade. In regions that experience prolonged freezing conditions, plant into a greenhouse border or overwinter under protection. Provide support for the young plants to climb and provide a minimum winter temperature of 7 degrees Celsius. These are NOT Copihue's seeds..! They look like Peumo seeds (Cryptocarya alba). Lapageria seeds are smaller, yellow, and spherical. Saludos..!